A revised edition of Handy Perinbanayagam A Memorial Volume & The Jaffna Youth Congress edited by Santasilan Kadirgamar, published by Kumaran Publishers, Colombo, was released under the auspices of the Indo-Lanka Foundation on March the 4, 2012 at the Saraswathy Hall in Colombo. The first edition of the above publication, also edited by Santasilan Kadirgamar, was produced and distributed by the Handy Perinbanayagam Commemoration Society in Jaffna on 28 June, 1980. A noteworthy feature of the present revised edition is its availability in all of the three national languages – – Sinhala, Tamil and English. It was the editor’s determination to make the ideals and vision of the late Handy Perinbanayagam, the founder of the Jaffna Youth Congress (JYC), accessible to all Sri Lankans that made him bring out the volume in all three languages. He endured the delay thus involved in bringing out the revised edition because of his motivation to release all three versions of the book simultaneously. It is both fitting and proper he should have done so. For Handy Perinbanayagam the Ceylonese nationalist (not, please note, a narrow ethnic nationalist) would not have wanted it any other way. The publication is most timely given that we are at a moment in our history when the need for a principled search for genuine national reconciliation is extremely urgent. To this end, the legacy of Handy Perinbanayagam and the Jaffna Youth Congress should serve as a stimulus and congenial guide. Absent such a reconciliation, our future as a united country is in far graver danger than most of us seem to realize. 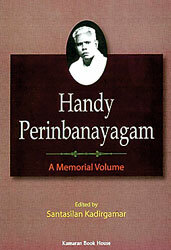 Handy Perinbanayagam (1899 – 1977) pioneered the movement in Ceylon for total national independence (‘Purna Swaraj’). Inspired by and imbued with the ideals of Mahatma Gandhi, he was an educationist of the highest calibre. He fought for the right of a child to be educated in her own native language and for a people’s right to be governed in their own. The book before us today is a well deserved tribute to Handy Perinbanayagam’s long and distinguished service to the people of Sri Lanka and to our world in general. His was the voice of liberal humanism. What Sinhala is to the Sinhalese, Tamil ought to be for the Tamils. A minority need not be subordinate to the majority in a free country. In spite of the reverses which the ideal of one Ceylon, Free Ceylon, has received recently we hold our faith in it. The conception of a free country where politics is free from the ideas of race and caste calls for courage and imagination and true statesmanship. We shall not subscribe to anything less than that, for nothing less will save Ceylon. Inspired as he was by Gandhian ideals, Handy Perinbanayagam never wavered from his ideal of a united and independent Sri Lanka. He believed utterly and steadfastly in the dignity and equality of all human beings and hence rejected any form of social exclusivity. Handy Perinbanayagam was also, when the occasion demanded it, unconventional and unorthodox in his thinking. At times, we thus find him in disagreement with the orthodoxy of the Christian Church. He subscribed to the view that the principles of Christianity and Saiva Siddanta were virtually inseparable. As a non-conformist , as one who likes to question dogmas and orthodoxies, and as one who prefers inclusivity to exclusivity, I have found myself naturally drawn to the independence of spirit and thought that marked the life and work of Handy Perinbanayagam. The educated Sri Lankans of the period around 1920 to mid- 1950s – – give or take a little – – much like Handy Perinbanayagam and others of the JYC, were part of the bilingual intelligentsia of our country. They were not frogs in the well as most of their counterparts appear to be today. Our predecessors, for the most part, were aware of our indigenous traditions and values just as much as they were familiar with traditions and values that are universally valid. They were at home in their indigenous languages as they were with English. We then had the ability and self- confidence to let other cultural winds blow across the length and breadth of our island home and absorb from those winds what was useful and leave out what was of no use. We thus achieved a synthesis of human values which stood us in good stead. It is a pity that we do not manifest that ability and that national self-confidence today. The ideals of the Gandhian movement, the idealism of the American missionaries who propagated western Christian liberal values (happily minus the vested interests the generality of their imperialist British counterparts manifested), and the impact of the Hindu nationalists who established Hindu schools in the north combined to shape the broad and humane worldview of the JYC. One of the defining features of the American missionary education enterprise in northern Sri Lanka was its emphasis on the study of both Tamil and English. It is the fine combination of this indigenous and non – indigenous tradition of learning that ensured that men like Handy Perinbanayagam and his JYC colleagues were not culturally divorced from their roots. They were thus rooted in the particular as at the same time they reached out to the universal. Though Arunachalam and his followers had no visible connection with the formation of the Students (sic) Congress (later the Youth Congress) in Jaffna, it is possible to conjecture that the breakup of the Ceylon National Congress and the formation of the Students Congress in Jaffna were not completely unrelated. Abahayavardhana goes on to make a key point about the Jaffna Students’ Congress in that it was a national and not a mere regional movement confined to the peninsular of Jaffna or the Northern and Eastern provinces. Its perspective, notes Abhayavardhana, ‘was an all-island one and its goal was explicitly announced to be independence, national unity, secularism, and the overcoming of all caste barriers. It contributed the first manifestation of genuine nationalism in the country’. We thus see that notable Sinhala Sri Lankans such as D.B. Dhanapala, P.de S. Kularatne, G.K.W. Perera, once a Principal of Nalanda Vidyalaya and later a State Councillor, A.E. Goonesinha the labour leader, the father of Marxism in Ceylon Philip Gunawardene (even though based in London at the time), D.S. Senanyake, George. E. de Silva, E.W. Perera, D. B. Jayatilaka, Francis de Zoysa, S. W. Dassanaike, S. W. R. D. Bandaranaike, N. M. Perera, Leslie Gunewardene, S. A. Wickremasinghe, W. Dahanayake , J. R. Jayewardene, Colvin R. de Silva and Selina Perera joined forces with the JHC. So also did up country Tamil leaders such as Peri Sunderam, Malay leaders such as T. B. Jayah. Not only was the JYC able to transcend ethnic limitations by having under its umbrella a diversity of Ceylonese, it was thereby also able to overcome the limitations of its peninsular base (Cheran 2009). The spirit of sturdy independence its members extolled is evident from the very first session of the JYC held at the Ridgeway Hall, Jaffna (later the site of the Jaffna Town Hall) on 29-31 December 1924. Handy Perinbanayagam was the chief organizer and he was assisted by several Jaffna youth, prominent among them being M. Balasunderam and S. Durai Raja Singham. The JYC was the first organization in that era made up of members from the English-educated class, in Jaffna or elsewhere in the country, to use one of the indigenous languages together with English in the conduct of its business. One of those present at the 1924 Sessions in his speech highlighted the national awakening taking place at that time in the country. He called upon those present to alleviate the suffering of the economically weak, the unemployed, and the oppressed men and women. These laudable objectives, he stressed, may be achieved through a sincere desire to serve the motherland (Kadirgamar 1980; 2012). The emphasis thus was very much on national unity, social justice, and sectarianism. The JYC may be considered as perhaps the earliest true nation builders of Ceylon. They were nationalists of a very special kind as distinct from the narrower type exemplified by G. G. Ponnambalam, S. W. R. D. Bandaranaike, S. J. V. Chelvanayakam, the Liberation Tigers of Thamil Eelam, the Janatha Vimukthi Peramuna and the Jathika Hela Urumaya and like-minded groups of non-political actors in the country. To his eternal credit, Handy Perinbanayagam did not join a political party. He remained true to his ideals to the very end. Although the JYC subscribed to egalitarianism, Perinbanayagam was not a Marxist. His vision was broader, far more significant, infinitely more all-encompassing, and humane. The achievement of Handy Perinbanayagam becomes the greater when we remember that his radicalism was nurtured and preserved in an essentially conservative caste-bound feudalistic Ceylon/Sri Lanka. Men of Handy Perinbanayagam’s calibre will forever be remembered by those of us free of narrow political and social agendas for their sincerity and integrity – – qualities sadly not much in evidence today in our badly fractured society. The Jaffna Students’ Congress, founded in 1924, held its first sessions that year in Jaffna. The period 1925 – 1931 was one of significant growth and, in the latter year, the Students’ Congress became the Jaffna Youth Congress. The second Annual Sessions of the Congress were held in Keerimalai in 1925 and was addressed by P. de. S. Kularatne who, it is reported, had his audience of visionary youth spellbound; the third scheduled for April 1926 were postponed to December 1926 and held in Keerimalai, the postponement being due to an outbreak of cholera in Jaffna. The Sessions of 1927 were significant as this was the year Mahatma Gandhi was chief guest at the invitation of Handy Perinbanayagam. One of the key decisions taken at the Annual Sessions of 1928 was to establish similar student organizations in Kandy, Galle and Colombo and in other posts of the country with the eventual aim of setting up an All – Ceylon Students’ Congress. This decision became a reality, as Santasilan Kadirgamar notes, in May 1931 with the holding of its inaugural meeting at The Plaza Theatre, Wellawatte. Kadirgamar tells us that Jawaharlal Nehru, at the time holidaying in Sri Lanka, had attended the meeting in Wellawatte. In 1929, the venue for the Annual Sessions of the JYC was Kankesanturai whilst that in 1930 was Thirunelvely. The Sessions of 1931 are significant as it was at them that the famous or infamous (depending on one’s perspective) ‘Jaffna Boycott’ resolution was passed. This resolution called upon the members of the JYC to refrain from participating in the elections to the State Council as there was no purna swaraj or self-government on offer. Earlier the JYC had rejected the Donoughmore Commission’s proposals for the same reason — for not going far enough in the direction of self-government. In 1931, as noted above, the Jaffna Students’ Congress became the Jaffna Youth Congress. The Seventh Annual Sessions were held at the Jaffna Esplanade with Srimathie Kamaladevi Chattopadhyaya, the sister- in- law of Sarojini Naidu as chief guest. 1934 is considered to be the year when the decline of the Congress began and the movement began to diminish as a force for change. It is also around this time that leading personalities of the day began to move once more towards sectarianism, moving away from the laudable goal of an overarching Ceylonese — as opposed to a Sinhala or Tamil nationalism with S.W.R.D. Bandaranaike founding the Sinhala Maha Jana Sabha and G. G. Ponnabalam the Tamil Maha Jana Sabhai. Apart from Jane Russell’s research into and commentary on the JYC in her doctoral dissertation published under the title Communal Politics under the Donoughmore Constitution 1931-1947 (Colombo: 1982), very little scholarly attention has been paid to the Jaffna Youth Congress by our historians and political scientists. Santasilan Kadirgamar’s indefatiguable labours as the primary historian of the JYC, therefore, assumes even greater significance. Somewhat cursory references to the JYC are found in the following publications: University of Ceylon History of Ceylon Volume 3 From the beginning of 19th Century to 1948, edited by K. M. de Silva (1973), Sri Lankan Tamil Nationalism Its Origins and Development in the 19th and 20th Centuries, A.J. Wilson(2000), S.J.V. Chelvanayakam and the Crisis of Sri Lankan Tamil Nationalism, 1947 – 1977 A Political Biography, A.J. Wilson (1994), A History of Sri Lanka, K.M. de Silva (1st Edition: 1980); (2nd Edition:2005), and Sri Lanka in the Modern Age A History of Contested Identities, Nira Wickramasinghe (2006). The protest movement (Jaffna Boycott) petered out after two years, but the Tamils had blundered by losing opportunities to secure places in the Board of Ministers, the elective executive under the Donoughmore Constitution. Jane Russell is of the view that ‘ the Youth Congress members performed social services in the villages, and their continual residence in the peninsula combined with such boldness, enthusiasm and almost quixotic idealism, made the Jaffna Youth Congress a very potent force indeed in the Northern Province from 1927 onwards’. The story of the Youth Congress is the story of a splendid failure, it is splendid, in spite of its failure. It failed not because of the usual vices that corrode public movements, but because of its very virtue. In spite of its end, as untimely as it was unmerited, the courage and the ideals that lay behind it and the tenacity of purpose that characterized it while it lasted constitute an inspiration to all who come after it. Not too many political or social movements ever receive an obituary as memorable as the above. In these bleak times we are passing through, the ever fragrant memory of the JYC serves to lift the spirit of those of us who yet pursue that seemingly elusive brand of Sri Lankan nationalism — as opposed to the narrow and harmful sectarian nationalism that some of our misguided citizens appear determined to pursue — and helps sustain the hope for a better and meaningful future for us all.